The mountains, deserts, people and history of the West have inspired artists for generations. 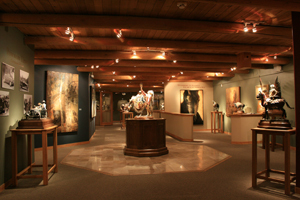 Celebrating our 16th season, Expressions Gallery offers contemporary and traditional works capturing the unique lifestyle of the American West. Dave McGary will be premiering his newest bronze from his Native American Children Series entitled, Little Good Voice Elk. Dave will be at the gallery meeting folks and talking about his new piece from 7-9 pm during the Anniversary ArtWalk. These three talented artist truly live an artful life! We celebrate there creative diversity not only in style, but in medium. Each one of them are know for something unique. Julie Bender with her amazing wildlife created by her special technique of Pyrography. Denise Rich with her “Contemporary Realism” cows, they appear as though like they will step off the canvas and moo! Fran Kievet, from Cowboys, Native American Dancers to Wildlife and Landscape, her subject matter is always changing and she has the ability to work the oil on the canvas giving life to every piece. Please come and meet these three talented ladies that have made a name for themselves in the world of art. Dave McGary will be premiering his latest masterwork from his Eastern Woodland Series entitled Trophy Hunters. This piece depicts two Mohawk warriors scouting the enemy during the French and Indian Wars in 1755. Many months of research, hours of sculpting and with much anticipation, we invite you to view the unveiling of this magnificent bronze at Dave’s Artist Reception. It’s all in the family with these two talented artist. A calibration of generations, this mother – son duo will be premiering wooden vessels created by David, and then accented by Mary painting her beautiful wildlife images on each vessel. They are extraordinary! Mary Roberson will also have her wildlife paintings featured. We invite to meet Mary and David in person!